So excited to let you know we have just passed $5000, and are now at $5049 raised towards our green light $9000 goal. Just $3951 more and we will have our project definitely up and away! There are just a few more hours left in our special Cassowary soft toy and book reward, so if you know anyone that would love this reward with the book, do let them know. Thanks so much to Dimity Powell, who blogged our project today, and shared her blog throughout her networks. We greatly appreciate the assistance of Dimity and many others who are letting the wider community know about our book. We acknowledge continual supporters on twitter like the Children Writers Guild, Alesa Lajana, Nancy, Vacen and Lenora Riegel, Pasifika Tales, Australian Women Writers, and Torey-Ann Torres, as well as their retweeting friends! A big thank you to Jan Cornall, the Writer’s Journey, and to Di Bates, at Buzz words for sharing information about our project in their newsletters. We now have a few multiple book order options available, as some people are buying one for themselves and one for a friend or library. So check out our custom rewards. ABC Far North Queensland did a prerecorded radio interview. We will inform you when we know when and where this is airing and if there is an online podcast link. Today the following stop press went out to schools. We realise that for many schools and libraries to consider the workshop option and day visits they need to budget well ahead of time. The schedule for this book is that it will be available October/November 2016 and the workshops will commence in 2017. We recommend if you would love a presentation or workshop or term project for 2017 pre-purchase at least the book or Education Reward 1 so we make sure it happens and goes into print. You will then have the satisfaction of knowing you supported a book which encourages the development of poets in our community from the earliest of ages. We will convert your skype in Education Reward to the introductory talk to a large school group. June has run poetry workshops in schools and for community groups, and has a graduate certificate in teaching and a PhD in writing empowerments. She is currently on an Australian Society of Authors mentorship for writing picture books and works mentoring University students in creative writing. Helene has taught art in India. She is an award winning artist with four picture books that will have been published by 2017. 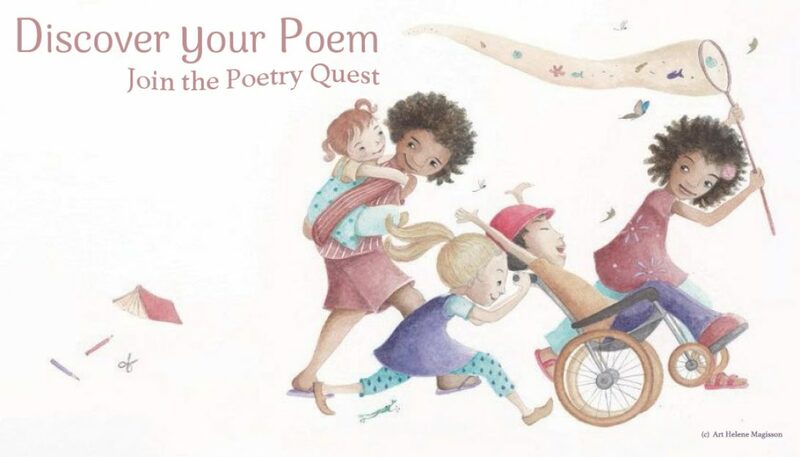 They are combining forces to inspire and share the process of collaboration, illustration, and poetry in programs will be suitable for budding illustrators and poets. Much of the information you will need for budget and grant consideration is on our project blog. Furthermore you can look at the educational rewards in the kickstarter to get an idea of the costs and programs we provide. First preference for 2017 workshops will be given to those schools and teachers who supported the kickstarter. June and Helene are based in Brisbane. Travel outside of Brisbane’s CBD more than 50 km will incur additional travel costs.